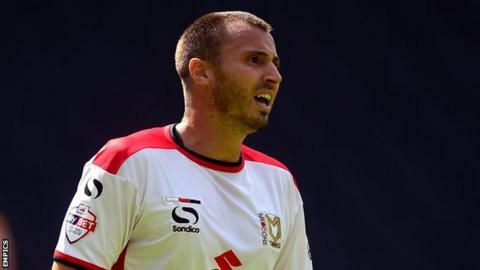 Antony's Kay first goal of the season was the difference as MK Dons beat fellow promotion hopefuls Swindon Town. The visitors took an early lead when Jonathan Obika tapped in from six yards from a Michael Smith cross. The Dons fought back in the second half, first through 18-year-old Dele Alli who curled the ball into the top corner five minutes after the break. Kay then smashed home from close range after a free-kick was flicked on to lift MK to third place in League One. The defeat saw Mark Cooper's side drop to fifth. "We worked so hard on the tactics, I think you could see. We didn't give them an inch all 90 minutes. "The disappointing thing for me was to concede, I thought it was against the run of play. "Benik Afobe has had his best game in an MK Dons shirt - that's the biggest applause he's got off the fans and he's not even scored. "All the players were brilliant today and the fans were magnificent." Match ends, MK Dons 2, Swindon Town 1. Second Half ends, MK Dons 2, Swindon Town 1. Attempt saved. Dele Alli (MK Dons) right footed shot from the left side of the six yard box is saved in the bottom left corner. Attempt blocked. Samir Carruthers (MK Dons) right footed shot from the centre of the box is blocked. Attempt blocked. William Grigg (MK Dons) right footed shot from the centre of the box is blocked. Corner, MK Dons. Conceded by Jordan Turnbull. Foul by William Grigg (MK Dons). Substitution, MK Dons. William Grigg replaces Benik Afobe. Dean Lewington (MK Dons) is shown the yellow card. Corner, Swindon Town. Conceded by Carl Baker. Substitution, MK Dons. Carl Baker replaces Dean Bowditch. Corner, Swindon Town. Conceded by Kyle McFadzean. Corner, Swindon Town. Conceded by Dean Bowditch. Substitution, Swindon Town. Andy Williams replaces Louis Thompson. Substitution, MK Dons. Samir Carruthers replaces Ben Reeves. Michael Smith (Swindon Town) is shown the yellow card. Michael Smith (Swindon Town) wins a free kick on the left wing. Corner, MK Dons. Conceded by Nathan Thompson. Attempt missed. Michael Smith (Swindon Town) header from the centre of the box is too high. Attempt missed. Benik Afobe (MK Dons) right footed shot from the left side of the box is close, but misses to the right. Substitution, Swindon Town. Harry Toffolo replaces Amari'i Bell. Goal! MK Dons 2, Swindon Town 1. Antony Kay (MK Dons) right footed shot from the left side of the six yard box to the top right corner. Assisted by Kyle McFadzean following a set piece situation. Amari'i Bell (Swindon Town) wins a free kick in the defensive half. Attempt saved. Jack Stephens (Swindon Town) right footed shot from outside the box is saved in the centre of the goal. Dean Bowditch (MK Dons) is shown the yellow card.